The opening night roster, barring unforeseen circumstance, is all but set. Despite the latest move of claiming Remi Ellie (Dallas) off waivers, the roster has been trimmed. Alex Nylander and Brendan Guhle were assigned to Rochester yesterday with Tage Thompson making the initial cut. To no one’s surprise, Rasmus Dahlin has made it and Matt Tennyson is up to be an extra defenseman. There are question marks surrounding the oft-injured Zach Bogosian as he was recently sidelined (lower body) but it is better if Tennyson/Nathan Beaulieu sit in the press box than Guhle. The Buffalo Sabres need for improvement is the understatement of the year. Need proof? Just ask any hockey fan watching this team for the past decade. Poor performances last season forced ticket holders to sell, or not sell them, at loss, which is embarrassing. All of the changes will be for nothing if the team does not endear the fans. It is still just changes on paper. 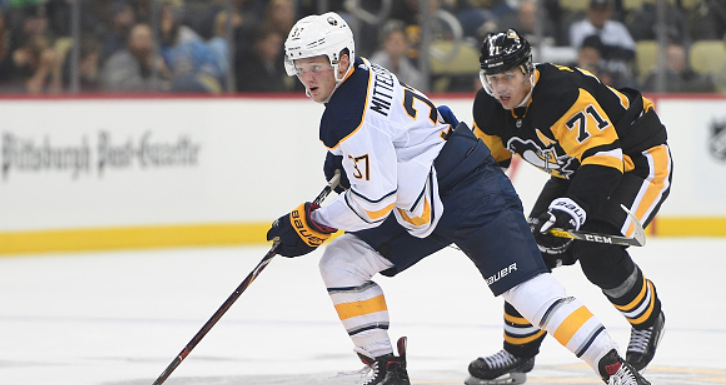 Jack Eichel has been named Captain of the team and he must lead the charge towards the postseason. In all fairness, Alex Nylander had a better camp than Thompson. Whether it was the depth on the left side or wanting the third year pro to further prove himself, Nylander will play top line minutes in the minors instead of less in the NHL. That being said, Thompson needs to show the management and coaches that it was the right decision. He was not as consistent as you would have hoped but had shown flashes of how good he can be in all zones. For a large young man, he does not use enough size to regain or control pucks. Offensively, his tremendous shot and hands have been on display while there are glimpses of promise on defense. To not be sent to Rochester or in the press box, the first game must be solid whether Thompson produces or not. He will be tested against a more developed club (Bruins). Since Daniel Briere and Chris Drury left town, the Sabres have been among the worst passing teams in the NHL. Ryan O’Reilly has been known as one of the better passers in the game but he could not solve this crippling issue. As a team, it has been awful. With the mix of youth and veterans added, will there be marked improvement in this category? Having Rasmus Dahlin should help this but he is just 18. Buffalo skaters must make smart passes and not necessarily the long, fancy ones. Few on this team, or on most, can make those plays. If the smart play is the short, 5 foot pass to get the puck up ice, do it. Up to this point, there is little evidence of smart passing. The anticipated starter between the pipes is the newly acquired Carter Hutton. The 32 year old had a strong campaign last season but will it hold up while playing more games. That is why goaltending is the most looming question surrounding the Sabres. Whether Hutton or Linus Ullmark, no one can predict how they will fare with regular, NHL playing time. Will Hutton make a good first impression after an up and down preseason? It will take improved play by the other five skaters for the team to succeed defensively but Hutton must be solid and make a big save from time to time. As stated in a previous article, projecting the Sabres’ season is difficult. The front office added significant forward depth as well as Rasmus Dahlin but that will not solve all issues. Buffalo needs strong defensive play and solid goaltending from those with little NHL experience (Hutton, Ullmark). Developing a rhythm will not come immediately but the acquisitions should make the game more fun. Predicted outcome: 4-2 Boston; game has action but the more seasoned Bruins are still a step ahead.